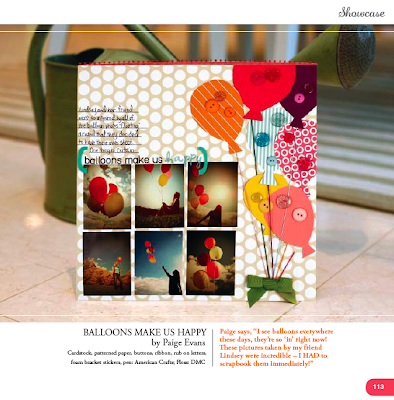 We had a hole in the Showcase section of a recent issue of Scrapbook Trends so I put in this layout. The photographers, Katie and Kristy, always make the layouts look so good. Pretty! Oh also, I made those pictures buy cutting out a little piece of paper and sticking it to my lens. Then it made the heart shape. Sweet layout! LOVE all those balloons! Just so cute! love love love this layout, paige!